Today we started off by going down to Colenet at 5 in the morning to feed the migrant camp workers cup of noodle. We gave out 250 cups of noodle and the migrant camp workers went to work with full bellies. While we were in Colenet serving the workers we met another group of missionaries called youth with a mission (YWAM) and disciples training service (DTS). We came back to Max's and ate breakfast and split off into our groups to work on the projects that the people needed help with. One group helped build a house for a mom with 8 children, another group went to a ranch to help build a hole for a septic tank. During lunchtime a group of us went to a tomato farm and served the workers hot dogs, chips, and chili. Later in the afternoon we started our quinceanera party and all the girls loved the food, the dancing, and the music. The dresses were very pretty and there were boys playing soccer out in the field and we had fun with them. That wraps up our day in Mexico! The call it "Mexico Time," and as American's, it seems like a whole new timezone, sin jetlag- without jet-lag. Even after many years of working down here, I find it takes me a few days to reset, not my internal clock in the sense that I am tired, but my internal clock that runs on my very American work schedule. At times, it has been my experience that Mexico time revolves not around our schedules, but rather the relationships we build. The wait for materials is one place that can be a stress point as my task oriented mind. I think that we have only x amount of days divided by x amount of projects and things need to arrive on time so we can continue to be on time with our projects. However; this is not what this is about- missions are about serving, and joining God where he is working, at his pace, not ours. Take the backhoe for example: We are digging a septic tank for Piedra Viva, and and order to install the tank the following has to happen: Dig the hole, bend the rebar, pour the foundation, lay the block, install the pipe, cover the tank. In my mind, as I run though the steps, I think, "Well, to dig the hole we need to hire a backhoe, order the materials and arrange to work with a mason. If I order the backhoe and the materials at the same time, it will put us right on schedule." Place our order, and here we go! The guy who we have used previous years to operate the backhoe no longer owns the business. The hardware store only has one guy whom they trust to operate their only machine. Unfortunately, this is also the only guy they trust to drive the materials to make deliveries unsupervised. Do you remember a riddle about a farmer who is taking a dog, a cat, and a mouse across a river? If he leaves the mouse with the cat on one side, the cat will eat the mouse; if the dog is left with the cat, the dog will eat the cat. Thus, the riddle is how does he transport them without them eating eachother- multiple trips. This is what this feels like. However, as I said, while my task oriented mind is buzzing about in my head, frustrated yet amused at this situation- I stop; look around; and observe the beauty before me: rich blue skies, beautiful rocky hills, quail and jackrabbits alight and hop around on the land before my eyes. Carlos calls me over, I have a long conversation with his son Jesus' ​and all is suddenly well. Today, we split into two groups and went to church this morning. One of the churches was in San Vicente and the other group went to Colonet. These churches both had many differences but both included many similarities. For one, it was all in spanish and most of us had no idea what the pastor was saying, but in the end Sandy help us figure it out. Also we all agreed that the services were wonderful and the pastors were very kind to us. Church was a very good way to start out our morning for our first day. After we all ate at Max's with the Quinceanera ladies, we split up into two groups with one of them going to The Ranch, La Casa, and a local Families house for a tour where we will be working over this next week. 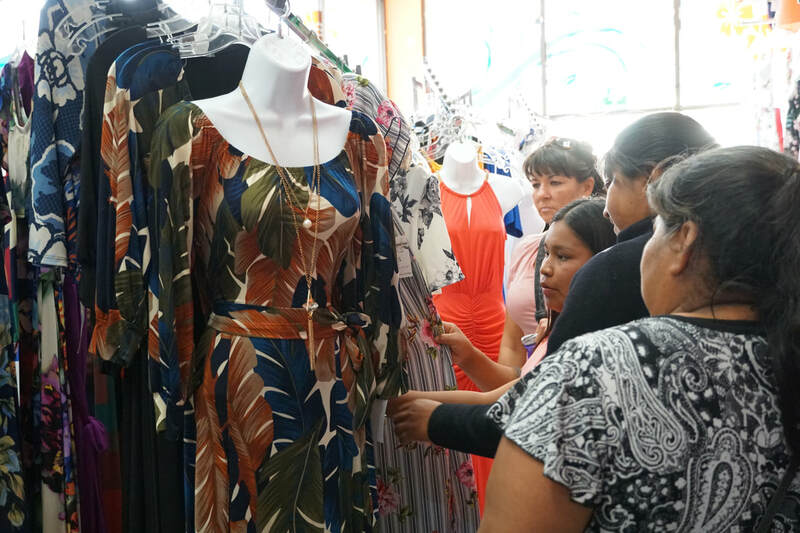 The other group with most of the girls went to Ensenada a town larger than Tacoma, to go dress shopping at The Mall for Quinceanera party. The girls were very excited to get their beautiful gowns for their coming of age party. After this we all meet up at Rudys for diner provided by the their family. It was muy delicioso. And after diner we all went back to Max's and settled down for the night, getting ready for a long day of working. The first day is coming to a close. Most of today was travel. We woke up early in the morning to fly to San Diego, then loaded into vans and drove through the border several hours south to San Vicente. We're all fairly exhausted, but we got street tacos for dinner and we've gotten ourselves situated in the place we are staying, heading to bed to rest up for the week.